After a bit of a blog break due to an amazing trip to Tokyo with my girlfriend (post to come soon) and the Christmas holidays, I am back for 2013 with one of my favourites so far. 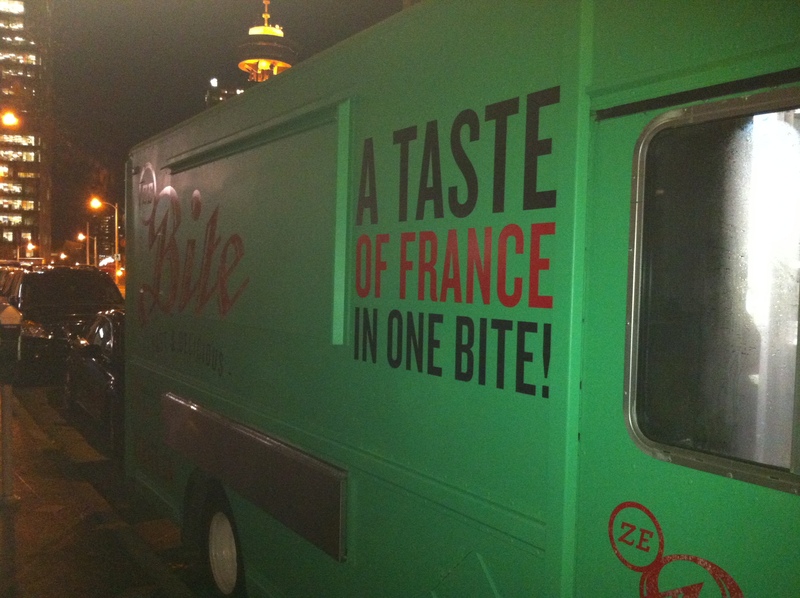 This post is my first to feature one of the city’s great food trucks, and Ze Bite Food Truck is especially great for more than a few reasons. 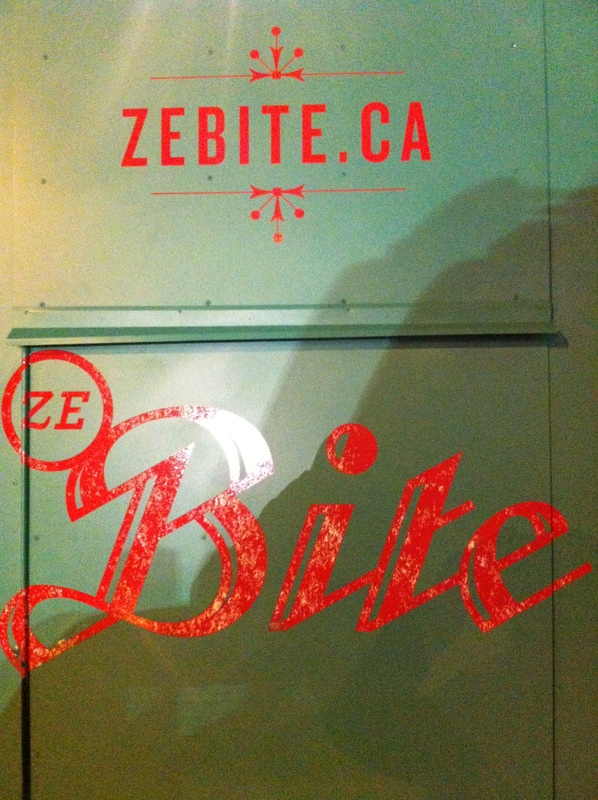 Ze Bite can be found Mon-Fri from 11:30am-2:30pm at the corner of Burrard and Cordova. The focus is traditional French comfort food, featuring stews like Boeuf Bourguignon, Ratatouille and other French classics, as well as scratch made soups and of course a few French style baguette sandwiches. I think we know what I was looking to try the day I walked up the window. They offer three sandwiches; there’s Ze Francais, a traditional French ham baguette, Ze Provencal, which is the vegetarian option and then there is Ze Pig, a pulled pork sandwich with a French twist. When I was there I had the chance to talk to chef/owner/operator Mathieu, a former resident of the city of Brittany, and he filled me in a few things about his food. The thing that makes the pulled pork French and totally unique is the way it’s seasoned. He uses a lot the flavours that one would use in a mulled wine, so you get cloves and nutmeg and even a hint of cinnamon. The orangy citrus flavour is also very apparent and really comes through in the meat. These flavours are all enhanced by the grainy dijon and the caramelized onions, staying with those classic and familiar French ingredients. But then another twist comes in that takes it over the top, fresh jalepenos! 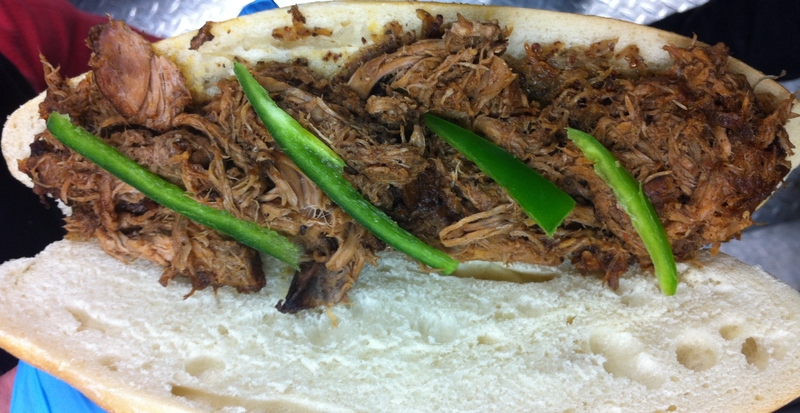 The heat from the jalepenos offer a great kick that matches up terrifically with the citrus and spiced pulled pork. All of this coming a fresh crunchy baguette, makes this sandwich a must have. So seeing as Ze Bite is a food truck, I was able pick any beer I’d like to accompany me on my trip there. I decided to bring along one from one of favourite breweries of the moment. 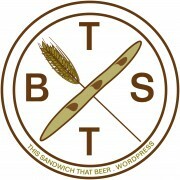 The beer that I paired with this sandwich was Hoyne Brewing’s Devil’s Dream IPA. This nice hoppy IPA that I grabbed at Legacy Liquor is from one the real leaders, in my opinion, of the BC craft beer scene. The Hoyne IPA pours a great copper colour with an off white head and has a strong hop aroma. The first thing that I noticed with this pairing is that the flavours battled each other, but in a good way. The strong hop bitterness in the beer matched up great with the subtle bitterness coming the pulled pork’s spices, and the citrus hop aroma went great the citrusy notes from the pork. The beer also did a great job combatting the heat from jalepenos. And as I previously stated, these two sort of engaged in a battle of strong, bold flavours with neither coming out a loser. So if you’re looking for a great pulled pork sandwich with French twist paired with a killer IPA from a stand out BC craft brewery, then head to Ze Bite Food Truck at Burrard and Cordova for This Sandwich and That Beer. Check out http://www.zebite.erinathene.com and http://www.hoynebrewing.ca for more info, follow them both on Twitter: @EatZeBite and @HoyneBeer, and follow me @TSTB_Blog.